Upcoming product info: Please note that updates and teasers will be posted at the top of this thread when available (refresh often). 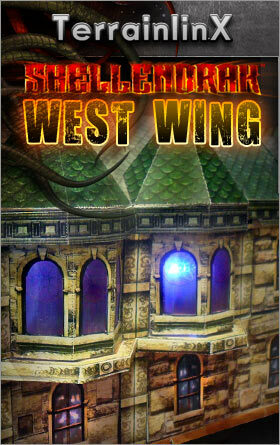 Renovations have proceeded apace, and the west wing of Shellendrak Manor is open for you to tour. Real estate going fast...don't mind the blood splatter on the floor there. Wow! That is an instant purchase for me. Have you been looking in my note book? Once again another beautiful piece from you guys. You are on fire! Wowo ! I never build the old Shellendrak, mainly because of space issues... With TLX, I may be tempted ! I like it a lot as I have always considered the original Shellendrak set to be my favourite WWG product. One thing I do miss in the TLX sets is the option for transparencies for windows. Any hope of seeing them return? Oh I was just looking at this after I posted and I am VERY happy with this set and will be buying and printing LOADS of this as I think it looks close enough to mix pretty nicely with SoH. With out a side by side comparison the walls look to be about the same color and this could do nicley for fantasy, modern or even old section in sci-fi with SoH to get a sprawling palace/mansion with a nice stone fence around it. This one includes transparencies (TITAN has some as well). We'll always give the option for transparencies when we can. Thoumont's TLX also has transparencies. This set looks great, and (hooray!) suitable for fantasy and mixing with Thoumont's TLX! Will be buying for sure! Alternate GSDs are provided for cut-out-windows to make transparency options easy. Transparent windows are avilable in both standard and stained glass variations. 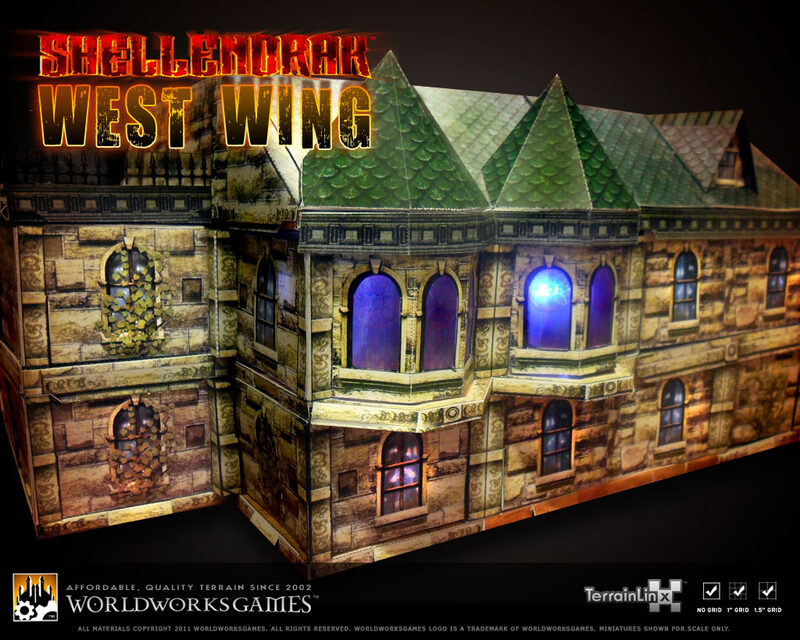 And yes...Shellendrak West has the Terrain Box, so if space is an issue, it comes with it's own pack-away-and-store option. That's great news, Bob. I was hoping those were transparencies in the picture you posted but I thought it best to ask, just to be certain. You guys sure know how to deliver! Fighting for survival in a war with the darkest powers. Look closely at the old Shellendrak, and the new Shellendrak Props They both have some of the trappings for a mad scientists lab. I was thinking it would make a good residence for a certain Dr. Herbert West professor at Miskatonic University. Some Mad Scientist lab equipment would definitely go well with that. Add some glassware, a few chalkboards, a lectern and we're in business! Still one of the best ghost stories ever written. And the more recent one was so very bad. Working on it, working on it...the pictures are taken, but finding the time to push them through post-production (sizing, branding, logoing, etc.) is taking a bit. Plus many more not listed! Downloading now! Can't wait to get it printed and built. Big congrats to Matt and Bob! Can't wait for East Wing!!! LOL I classify films like that as 'Guilty Pleasures'. HellHouse sits alongside Lifeforce in my 'dumb but fun' category. The '63 Haunting (directed of course by Robert Wise) is a masterpiece of suspensful storytelling. The editing and use of sound to build tension is achieved so well, and at a level almost never equalled by its contemporaries and more recent films in the same genre. Back to Shellendrak though, and very much looking forward to purchasing the new wing. I haven't been through all the TLX threads here and was wondering what happens when a product like Shellendrak gets the 'treatment'. Do owners of the original product get a dicount on the upgrade? From what I have read it is obvious that a lot of effort goes into the modification of the files. I don't own any TLX upgraded products, and I definitely didn't mean to step on toes by asking the question. Just unsure of the process that has happened with other products.